Every Cobalt MedPlans outsourcing engagement is customized to meet the client’s needs. We do this by designing our work around your specific requirements, including hiring, processes, policies, and working within your platform. Our nimble and flexible approach to designing each unique engagement allows us to deliver successfully as your needs change over time. Flexible, tactical engagements enable us to adjust very quickly to your needs as they change over time. Our agile team works seamlessly within your unique workflows, processing platforms, policies and procedures, business requirements, and SLAs. No client PHI is stored in a Cobalt MedPlans environment. We are committed to tailoring a solution to meet your specific needs. We collaborate with your team to provide overflow services during transitions such as planned operational disruptions like system conversion or facility consolidation. This includes support through a ramp-up period as the transition is planned, a plateau period as the conversion commences, and an ensuing ramp down as the customer regains operational stability. If you want to be ready for a possible outage, consider the benefits of having a team of management, trainers, QA experts, and claims examiners or customer service representatives familiar with your line of business who can immediately transition into your workflow when you need it. Because an environmental or technical outage could result in an operations shutdown, our Safety Net solution provides clients with peace of mind knowing a team of experts is ready to jump in to help. The breadth and depth of our experience with a host of applications make us experts at developing training programs. At Cobalt MedPlans, training is not just a business need—it's one of our core competencies. Our extensive knowledge and well-managed procedures lead to rapid deployments without sacrificing accuracy and service. Our Train the Trainer Program is designed to provide a smooth transition into Cobalt MedPlans' outsourcing services. Our trainer typically travels to our client’s location and works with the client’s trainers to observe, learn, and document the process. The trainer returns to Cobalt MedPlans and develops a curriculum and job aides, and creates policies and procedures, based on our client's requirements. Our trainer then trains the Cobalt MedPlans' production staff and auditors assigned to the engagement. 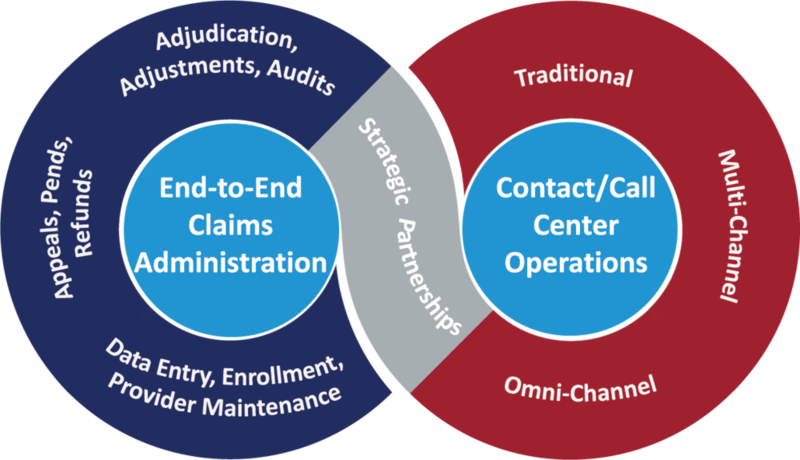 Variable and scalable claims processing is an essential service that allows us to assist clients with ongoing claims processing and quality improvement initiatives. We focus on providing clients the highest level of satisfaction and that begins with hiring the right people with the right experience. Our experienced professionals function as an extension of your team to seamlessly perform accurate and cost-effective claims management and contact center functions. We use your existing applications and processes to help you manage backlogs. We partner with you to supplement or replace short- or long-term staffing needs. Because of our unique size and expertise, we help you reduce overhead, time and resources associated with back office operations, which will free up resources for your corporate and member-centric initiatives.